1. One year ago on this day, our souls became one. I feel so blessed to be your life partner. Thanks for respecting my feelings and for always understanding me. Happy one year of togetherness! 2. The most precious gift that God has ever given me is you, dear husband! Congratulations on our first year of married life! It was wonderful to share all the things with a person like you. I hope our love will remain the same forever! 3. Last year, on this beautiful date two wonderful heart had united. 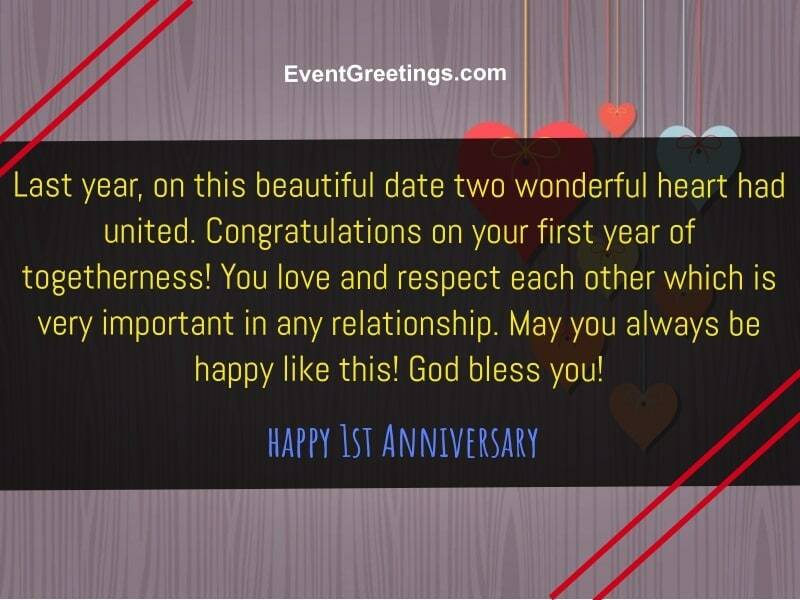 Congratulations on your first year of togetherness! You love and respect each other which is very important in any relationship. May you always be happy like this! God bless you! 4. My dear wife, happy 1st wedding anniversary! I may not be that expressive but I know that you can feel how much I feel for you. I just hope that till my last breath I will find you next to me. Love you! 5. The luckiest person is he/she who finds a true friend in his/her life partner. Undoubtedly I’m one of that luckiest person. My girl, happy 1st wedding anniversary! May our bond becomes even stronger every day! 6. My dear love, I’m so grateful to God for making you, my spouse. You are one of the most important parts of my life without whom I’m incomplete. This last year was the most beautiful year of my life. May our love only increase day by day! Happy 1st anniversary! 7. My son and beautiful daughter-in-law, congratulations on your 1st year of the wedding! I’m thankful to the Almighty that my son has found the best partner in his life. Wishing you both an amazing and memorable day! 8. Congratulations to us for our successful one year of marriage! On this special day, I want you to know again that, I’ll always be there for you. I’ll never leave your hand and no matter what comes, my love for you will never be less. 9. I send this message with great love and affection to one of the most beautiful couples who successfully completed the first year of their wedding today. Congratulation to both of you! May God keep you happy and bless you with a healthy child soon! 10. My dear, today is very special as it’s your first wedding anniversary. Congratulations to both of you! I’m happy to be a part of this beautiful celebration. Wish you all the very best for your upcoming days! 11. The most important day of this year has come. Happy 1 year anniversary, my daughter! I am so happy for both of you dear. Always be like this. You should give thanks to God who offers you happiness every day. 12. Many congratulations for the 1st year of your love! It’s really good to see you together happy. If you stay strong and trust each other, then nothing can destroy your bond. May God keep showering his blessings upon you and fulfill all your wishes! 13. Dear lovely wife, you are my strength and my inspiration. You are special to me every day. It’s impossible to measure my love for you. May we always walk on the same route of life holding the hand! Happy 1st year of our relation! 14. My better half, happy 1 year wedding anniversary! Our love, trust, and respect for each other is the basis of our relationship. Sometimes we fought, argue but I believe that it’s a part of our love. 15. My love, in all these 365 days, there were many beautiful moments with you. Before meeting you, I didn’t know the true meaning of love and affection. You are the best life partner and are perfect in every way. Thanks for fulfilling me. Happy 1st anniversary! 16. My dear daughter, the best thing for any parents is to see their children’s happiness. We are blessed seeing you both happy. Congratulations, my child on your one year anniversary! Wish you a successful married life! 17. My dear friend, it’s wonderful to see you celebrating your first season of love. Happy anniversary! Enjoy this lovely day with much fun and make a lot of beautiful memories. Cheers! 18. Congratulations on the 1st year of your love story! I’ve never seen such a special couple. Celebrate this beautiful day and keep celebrating your love every day. Be happy always. My blessings are with you! 19. Beloved husband, today, we are to be congratulated on our 1st year of wedding! Thanks for always supporting me and making me feel special. May our love continue growing every day and our marriage last forever! 20. You are the person I always dreamt to spend my life. All the love for you, gorgeous lady! I hope this day be the beginning of another lovely year of our togetherness! 21. Happy 1st anniversary, lovebirds! You are a perfect couple and made for each other. May God bless your relationship and protect you always! 22. It’s time to celebrate your 365 days of the union. Happy anniversary, lovely couple! May this day be filled with many good wishes and blessings! Wish you many years of happy life! 23. The most awaited day has finally come. Happy 1st anniversary, my queen! The love we have for each other is the root of our bond. I wish we’ll always be celebrating this day together! 24. Happy first year of togetherness, dear! There is still a long way to go together. Love is the most essential thing in any relationship. I wish both of you much happiness! Be blessed! 25. It was really wonderful to share our lives, dear. I feel peace at your side and I can do anything to keep your smiling face. Happy one year of the wedding! May this day come again and again in our lives! 26. One year ago, my prayers were answered. I got married to a person who not only the best soulmate but also my best friend. I can proudly say that I’m the most fortunate women in the world. My king, many congratulations on our first anniversary! You made me feel loved every day. I can’t imagine living without you. I wish God will always bless us and make our unity even stronger! 27. Today we celebrate our first year of life together. My life doesn’t make sense without you. You have completed me and made me understand the meaning of true love. Thanks for tolerating my immaturity and making me the queen of your kingdom. Today I promise that I will try my best to make our lovely family happier every day. Love you so much today and forever! 28. Beloved life partner, happy 1st anniversary! Being your wife is the best thing that ever happened to my life. I don’t think there would be any reason to smile without you. My life is beautiful because you exist in it. You are my inspiration and are perfect in all the way. I don’t know what I’ve done so right that God has given me such a wonderful husband! Cheers to our amazing bond! 29. Beloved soulmate, the best decision I have ever taken was marrying you. I feel proud that you are my husband. You fulfilled all the promises you made. You are my life, my superhero, my protector and my everything. Happy 1st anniversary! In this 1 year, I had enjoyed every second at your side. All I wish today is to be with you until my death. 30. My handsome partner, congratulations for successfully completing the first year of marriage! I can’t explain how happy I am today. You are the man of my dream and nothing is great than sharing my life with you. The greatest blessings for me is to be a part of your life. Thanks for caring me, respecting me, listening to me and of course giving me the infinite love. 31. I can’t believe that 1 year has passed so fast, it still seems that just yesterday we got married. Happy first wedding anniversary, gorgeous! You were my dream that came true. No matter what I’m doing, I always think of you. I may not be a perfect husband but there’s no doubt that you are the perfect wife. I wish we’ll have a wonderful journey of life together! 32. It’s been one year since we said yes before God. Every day you make me feel how special I am to you. Nobody understands me as like as you. I don’t know how I would have survived if I never met you. My girl, thank you so much for everything you’ve done for me. I want to make you feel as happy as I feel by being your side. Happy 1st anniversary, my love! 33. Happy 1 year anniversary, my sweetheart! During this year, the love we shared, the laugh we had together and all the time we spent with each other were the best moments for me and I wish this will never end. Thanks for loving me unconditionally and making me what I’m today. Love you a lot and wish to spend the rest of my life with you. 34. My dear soulmate, happy first anniversary! This year has passed so quickly because I was so happy with you. Every day I give thanks to God to send you in my life. Everything seems okay when we are together. You are just perfect and I couldn’t ask for a better life partner than you. We truly made for each other. May we always be like this and our love lasts forever! 35. The best feeling is to live with the person you love the most. And I’m the luckiest person to have you in my life. Time flies quickly when I’m with you. You are like the sunshine who only knows how to light up life. You have decorated my messed up life. You are the best wife and my best friend. Love you darling! No matter what comes, may we never apart from each other! Wishing us a wonderful 1st anniversary!